In Turkey, the President is required by the country’s constitution to be neutral in all matters of politics. Yet Recep Tayyip Erdogan has disregarded this important stipulation ever since his tenure began in 2014. From publicly supporting his former party — the Justice and Development Party, or AKP — in matters of policy to urging the public to vote for them, Erdogan has continued to reach further for influence and control over the country’s government. This is only the beginning of his offenses. Among the controversies of Erdogan’s administration, his sluggishness in leading the country against the Islamic State (IS) in 2015 was chief. A hatred of the Kurdish population contributed significantly to Erdogan’s unwillingness to join the fight, as they were the main group in opposition to IS at the time. And despite the fact that Turkey eventually did engage in combat with IS forces, United States forces uncovered evidence during a raid of IS compounds. The intel allegedly indicated that communication and dealings took place between ranking members of IS and Turkish officials. In addition, Erdogan and his government have taken significant steps to quash any form of free press. This has mainly involved seizing news publications in order to prevent them from potentially criticizing the government’s actions. And when the Constitutional Court ruled that the state had violated the rights of two opposition journalists by detaining them, Erdogan took to television to make a thinly veiled threat against the Court’s legitimacy. With such a track record of despotism, not to mention his tenuous relationship with the secular nature of the state, a coup attempt against Erdogan seemed to be inevitable. On the evening of July 15, it looked as though the inevitable was coming to fruition; tanks rolled into the streets of three major Turkish cities, major roadways out of Turkey were barricaded and social media websites were blocked. A state newscast was taken over by rebels claiming the military was in control and denouncing the legitimacy of Erdogan’s administration. Hours passed before Erdogan returned from a vacation — on a plane allegedly “harassed” by rebel jets — and was able to address the people of Turkey via FaceTime on a phone held up to a news camera. In an unprecedented strategic move, Erdogan implored millions of Turkish citizens to take to the streets and stand up to the revolting military forces. Thousands appeared to heed his request, and further chaos ensued for several hours before the overwhelmed insurgents surrendered around 6 a.m. on July 16. All told, more than 200 “martyrs” not involved with the revolt died, including 145 civilians and 60 police officers. Turkish officials report that 24 coup-plotters were killed in the fray, but nearly 20,000 government workers and law enforcement agents have been detained or suspended by Erdogan’s administration due to possible ties with the plot. It is unclear how, if at all, the attempted coup will shift the priorities of Erdogan’s administration. Perhaps unsurprisingly, criticisms of the government’s handling of the uprising have been immediately stifled; the foreign ministry has equated questioning the establishment response with supporting a plot to overthrow it. 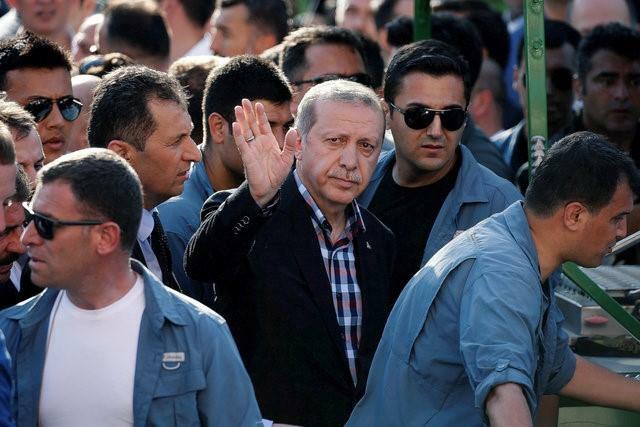 Some opponents of Erdogan, according to Reuters, believe that the mass detainments and suspensions are an attempt to further consolidate the president’s power, and some further believe that the coup was staged in order to remove opposition leaders in the military. As the Turkish government continues the process of mitigating the coup attempt, it is clear that Erdogan will not revert to his position’s requisite neutrality any time soon.